Most might see a pile of trash, but this would-be junk is perfect for my vision. 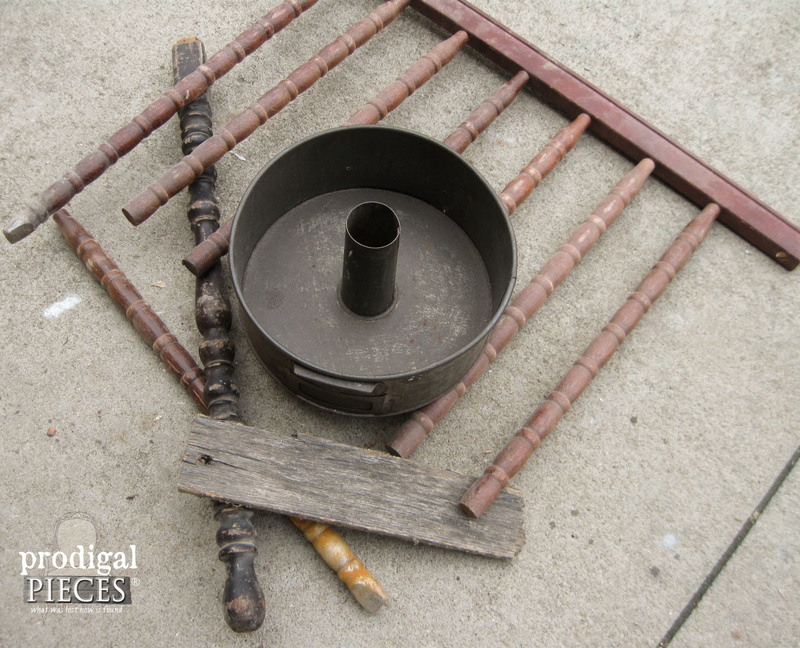 In this “mess” is a vintage cake pan, a piece of pallet wood, and crib rail spindles. 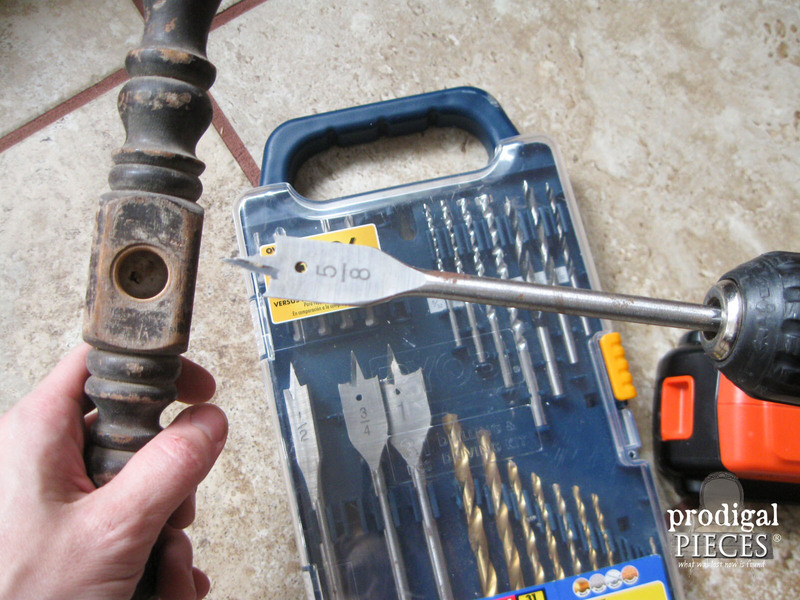 Same as in my last project, I use my drill to take that antique table leg hole all the way through. My plan is to stick that antique table leg in the center of the cake pan, so I whittled a bit off of the one end with my utility knife to make it fit. 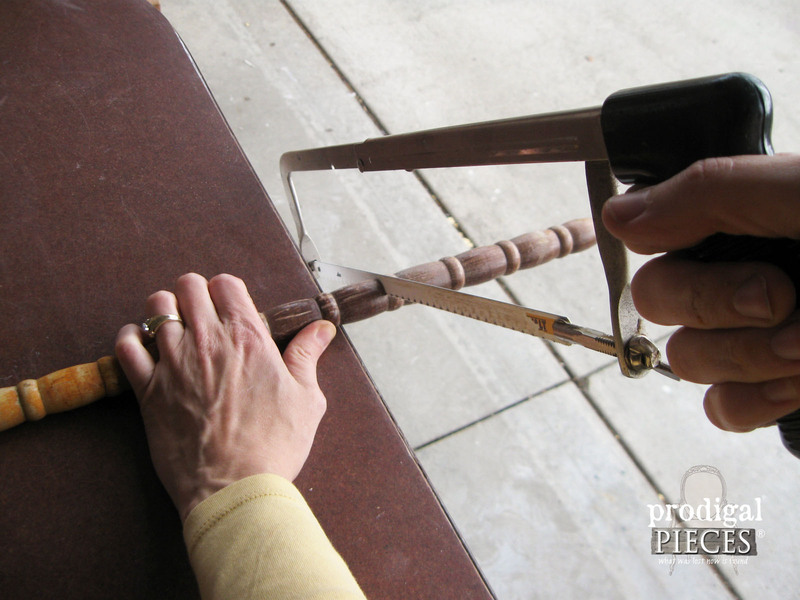 Next, I use a hacksaw to cut a couple of the crib rail spindles to length. Sometimes you don’ t need power tools, right? Those spindles become the cross pieces and then I use that piece of pallet wood to add text. 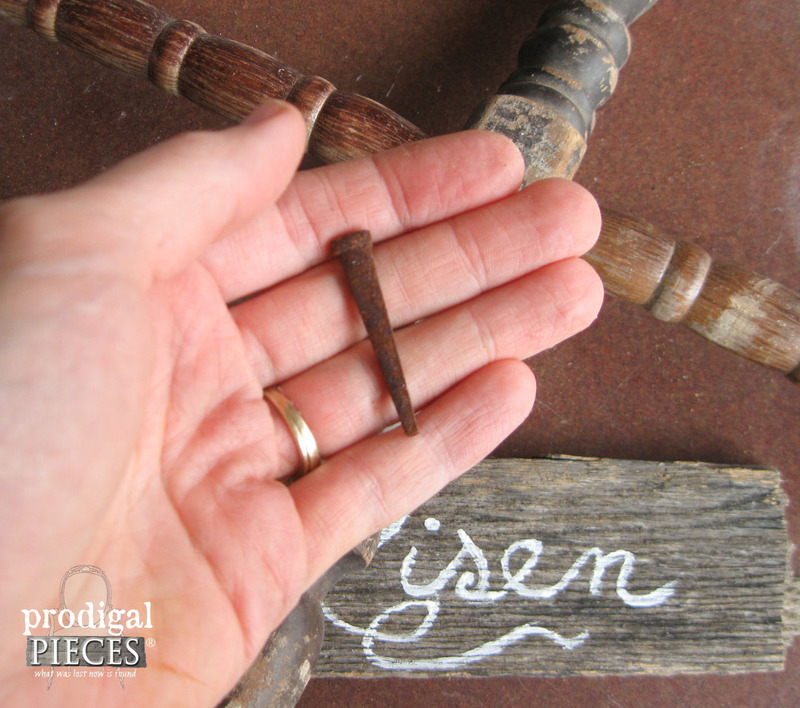 In order to attach the sign to the cross, I used on of my rusted square head nails. Want to rust your own? Just head HERE to get the tutorial. After adding a slip of a vintage lace tablecloth (I always grab those when thrifting), I totally thought the cake pan base looked perfect as a planter. Some of my girls and I filled it with succulents. I have the best helpers in the world! 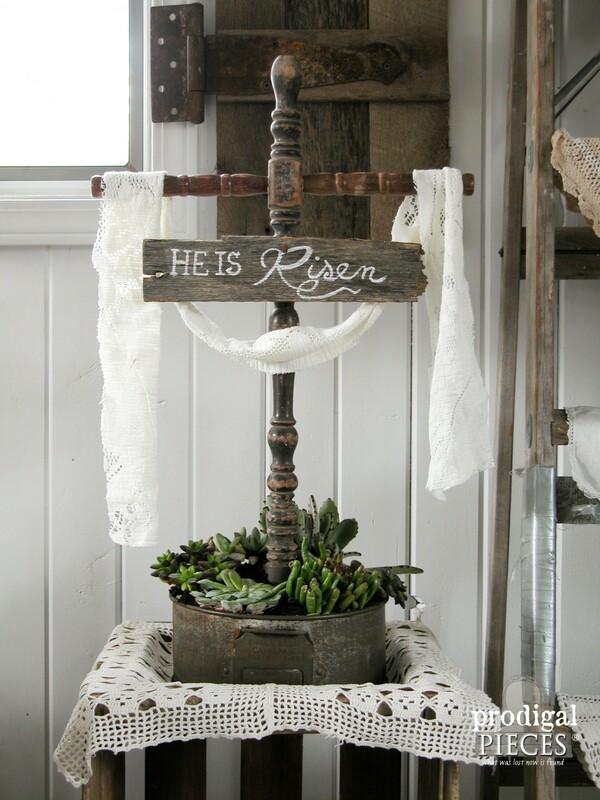 My funky, repurposed Easter cross is ready to celebrate the glory of my Savior’s reign. 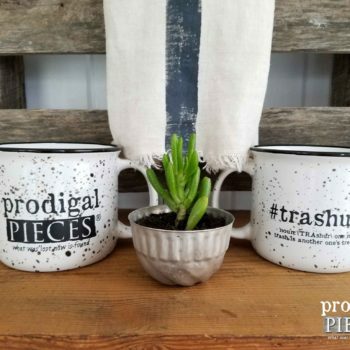 For me, this creation is not only a symbol of God’s love for us and His victory over the grave, but the succulents are symbolic of how His love is fresh and new every morning. 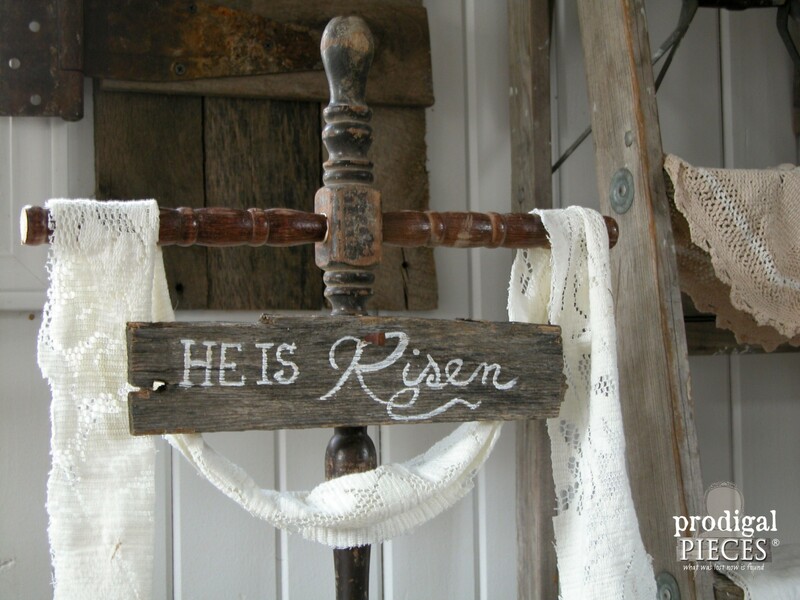 At one point, I felt like how this Easter cross used used to be – feeling worn and needing new purpose. I am eternally thankful that I have a heavenly Father that sees fit to never quit on me and throw me out in the trash. Stay tuned for next week, as I plan to update you on our kitchen remodel and share more of my DIY projects. 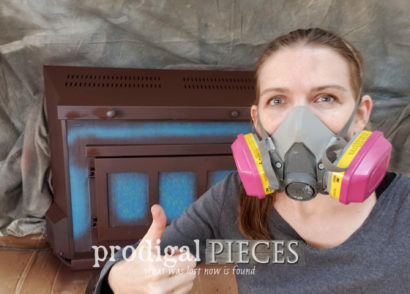 To get these DIY tips & tricks in your inbox, be sure to sign up for my newsletter. PLUS, you will get your FREE Furniture Buying Checklist and special discount to my shop. Until next time! 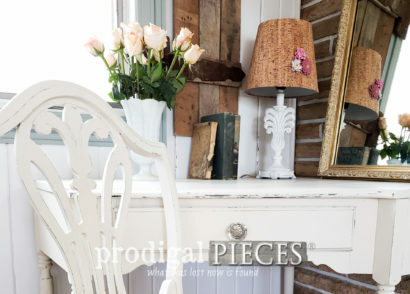 I adore your upcycled spindle project! It works great at Easter and then if you take the sign off it could hold other things during the rest of the year. Pretty! . Exactly. 😀 Thank you, Wendi! So simple but powerful. Love it. That cross is a blessing! This is wonderful and very meaningful. i have a BUNDLE of spindles I have been collecting over the years. Now I can make some crosses out of them. PS this last weekend , I bought a beautiful vintage flower arrangement that had three spindles in it along with the flowers. It was very nice. Just passing along to you as another use for your longer skinny spindles. I am going to dry brush some of mine to add a little color in my floral arrangements. Thanks! That would be wonderful and thanks for the tip! I actually have plans for the rest of those with a project soon. hee hee hee. Larissa, it is so wonderful what you did and the message and hope it gives to us all. I truly wanted to inspire. Thank you, Jolinda! 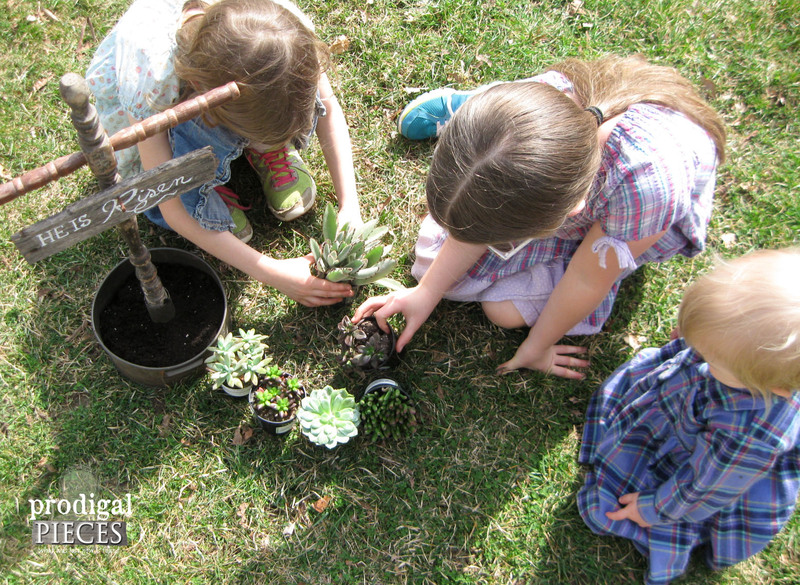 Beautiful way to celebrate Easter & the resurrection of Christ! Love it! Going to show this to my momma who is in charge of the church decorations. She will love this for the entry table. We’ll have all the stuff needed in the old milk barn to make it. Just have to get some succulents. Thanks for the inspiration!! That’s wonderful to hear, Sherry! Thank you so much for the love. You are da bomb as well, Marie! Yes, up and down temps here, but I’m still aching for sun, sun, SUN! A very inspirational post Larissa. We sh uld not forget the meaning of Easter among all the bunnies and eggs. A blessed Easter to you and your family. So pretty – love that you added the succulents! What a great repurpose and reminder of what our Savior has done for us. Thanks so much, Adina. It’s the least I could do. I love seeing what you create with junk that most people would never give a second glance. 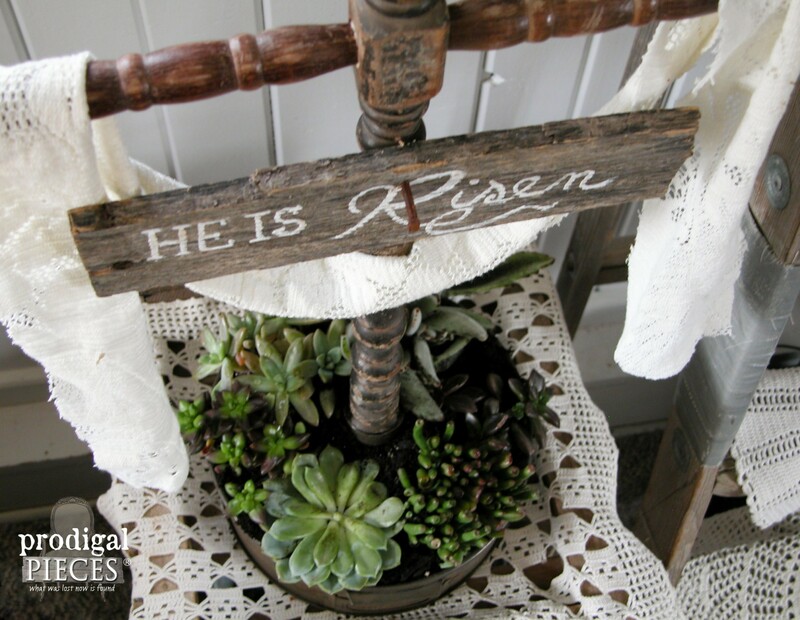 This is perfect for Easter and you can use it year after year. This is so beautiful, Larissa! I loved to see your girls helping as well! They are always lurking the shadows and love to watch. It’s fun! Thank you! What a perfect Easter decoration. And it is so lovely to see the kids too! So creative and what a beautiful statement for this season of Lent! All I can say is WOW! I absolutely love this! 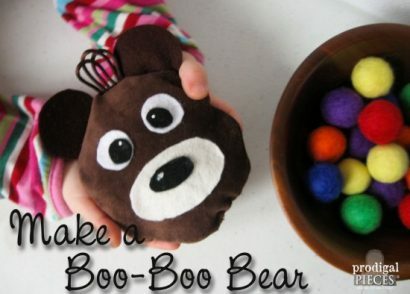 I must make one for myself! 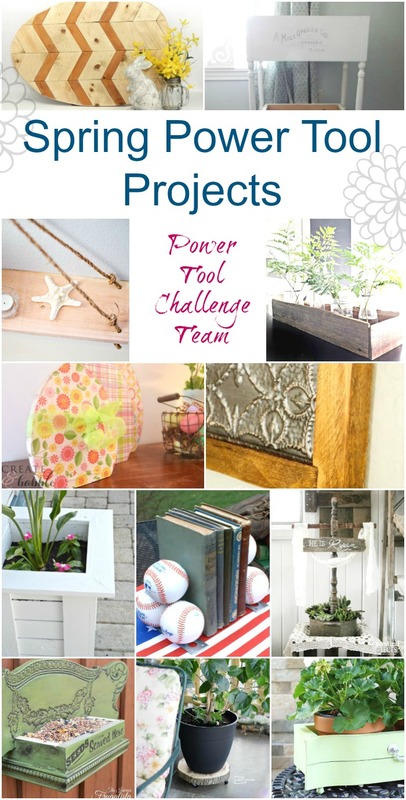 One of my favorite projects you have posted. Thank you for doing an Easter post reminding us that Christ’s death and resurrection is the true meaning of Easter. I believe this cross is my favorite makeover that you’ve ever done! Thanks for sharing this inspirational message for us and for not being afraid to share your faith with your followers! You rock!!! How wonderful to hear. Yes, so very exciting that we can celebrate and look forward to His return and Reign. He is risen! Thank you so much, Debra. You too! 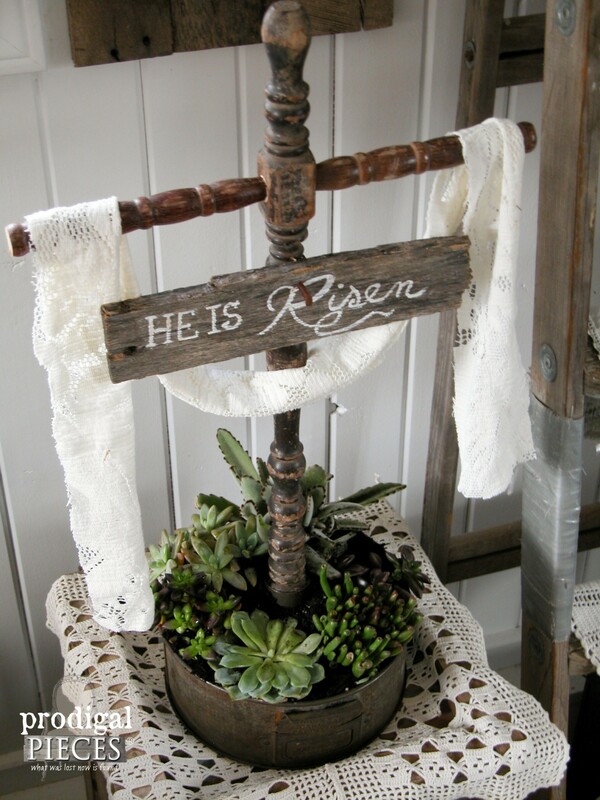 This is absolutely beautiful and i hope to make one to grace my porch in time for Easter Sunday. Thank you for sharing. So sweet of you to say, Monica. Happy Easter to you. He lives!